ERT Consultants, LLC prides itself on developing and delivering training programs that teach cutting-edge skills to emergency response professionals. We provide in-depth, hands-on training for all of our students, looking to solve rescue situations under real life conditions. Courses are available focusing on technical rescue, fire and medical training, incident command, explosives, various NJ State Police certified training, and PADI SCUBA courses. 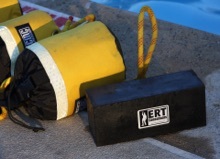 ERT Consultants, LLC is a proud distributor for the finest technical rescue & fire equipment on the market today.